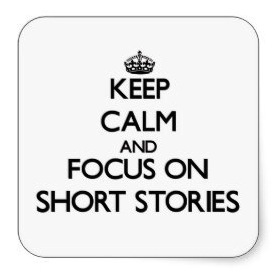 February 1st is the start of Short Story February, during which I’ll be reading pretty much exclusively short stories. Starting next Monday, and continuing through the end of the month, I’ll be reporting on my short story reading, and hoping you comment on yours, here and/or on your blog, if you have one. Give us a link in your comment. Each week I’ll pick a cover of one of the collections/anthologies from which I’ve read during the week. note: Barbara isn’t much of a short story reader, so we’ll catch up with her reading in March. This entry was posted in Books & Reading, Short Story February. Bookmark the permalink. I like it! Since I’ve been keeping a complete list of ALL stories read for the last three years (plus this year) it will be easy to reference what I’ve read this month. I read 55 stories in January, about the same as last January. I try and find shorter stories when I can, frankly, and when I read a collection of longer works I will try and find some short shorts to mix in. If it is a “short story” by Stephen King, say, that is 100 pages – he may call it a story, I may call it something else – I will read something very short first to make sure I get my story-per-day in first. Back to January. I finished 4 collections – by Ray Garton, John Scalzi, Jennifer Egan, and Brian Freemantle. I have collections by Tony Earley (a novella and stories; will try the first today) and Saki (mostly short ones) immediately ahead. Also have 3 Fritz Leiber collections on the Kindle, so we’ll see how it goes. Excellent, glad to have you with us. Just in time for your Short Story Month, Night Shade books sent me a new SF anthology, GALACTIC EMPIRES. I’ll be reading a story per day from that Big Fat Book to start. Saw this at B&N. Good table of contents. O’Hara a day for me. A really good choice, Patti. I went through a short-story phase a few months back and reviewed a good many anthologies on my blog. I’m mostly sticking to novels these days. I’ve got a collection of stories I want to start soon. I will start with one or more short stories today. I do have a book I started in January to finish, and I plan to read Laura by Caspary this month, but otherwise I am sticking to short stories. I read two stories over breakfast. After errands and chores I’ll read a few more. I have no specific goal for numbers to read, or books to finish, I’m just concentrating on SS this month. Will give me a chance to catch up on some new stories and a rereading of some old stories. Still reading novels though. The new Ian Rankin came today. Can’t put that off a month. I hear you, Steve, but some SS reading is a good thing. Richard, a couple of years ago, I embarked on a personal meme where I’d decided to read a certain number of short stories but the whole thing fizzled out. I probably read about 30-35 stories that year. This sounds exciting. I will give it a thought. It’s simple, really. Pick up a book of short stories today, and read one. Do it again tomorrow, if you have time. Voila.